One of the longer and newer routes to the roof of Africa, Lemosho is for trekkers up for a bit more challenge. Because of the longer time on the mountain, this also increases climbers chance of summitting by ensuring proper acclimitisation. Not too long ago, there were 2 main route options for Kili. Now, with increasing popularity, the government has seen the benefit of offering more options and, this route is one of the benefits! Have a look below at the full itinerary and, get in touch if you have any questions. This is a camping expedition! All accommodation during the trek itself is in tents. A team of porters and guides will ensure that a great camp is set up each night and, excellent food is available for all meals. While this trek will certainly be a challenge for most, our team will ensure that all participants are as comfortable as possible throughout. The dates available are for fixed departures for mixed groups. If you have a group (minimum 5), we can organize a private trip on any date with availability. Just send an inquiry to find out more. Climbers are taken to the gate at 2,000 metres at the entrance to the forest for entrance formalities, and then to the trailhead at Lemosho Glades at 2,200 metres. This is a long drive from Marangu – including the stop for gate formalities it often takes around 5 hours. The forest track to Lemosho Glades is also in poor condition, and vehicles often have to stop short of the trailhead, particularly in wet weather. From the trailhead, there is a 3 to 4 hour walk, ascending quite steeply through the forest, until a camp is made in a forest clearing dominated by a large tree – this is Mti Mkubwa camp at 2,800 metres. Climbers emerge onto the moorland above the forest after about an hour, then detour northwards around the Shira ridge, through beautiful and rugged moorland with views northwards and westwards to the plains below the mountain. At the northern edge of the Shira ridge, the path turns eastwards and drops down onto the Shira plateau. Camp is made by a stream at Shira One campsite at 3,500 metres. Total time is about 6 to 7 hours. The trail continues across the plateau towards Kibo. After about 2 hours, the edge of the plateau is reached and the path climbs up for about 40 minutes to Shira hut at 3800 metres. Total time is about 3 hours, therefore, if the direct route is taken. However, this day affords the opportunity to branch off the trail and climb Shira Cathedral and Shira Needle, the imposing hills on the southern side of the plateau, and to look down the Machame ridge from their tops. It is also possible to visit Cone Place, the centre of the extinct Shira volcano, and to look from there at the highest parts of the Shira plateau - Johnsell Point and Klute Peak on the western Shira ridge. The path continues through high altitude desert directly up the ridge towards Kibo. After about 4 hours, Lava Tower is reached at 4,500 metres. Climbers are now directly at the foot of the Great Western Breach of Kibo, the scene of a massive avalanche in pre-historic days which formed the Umbwe Valley. 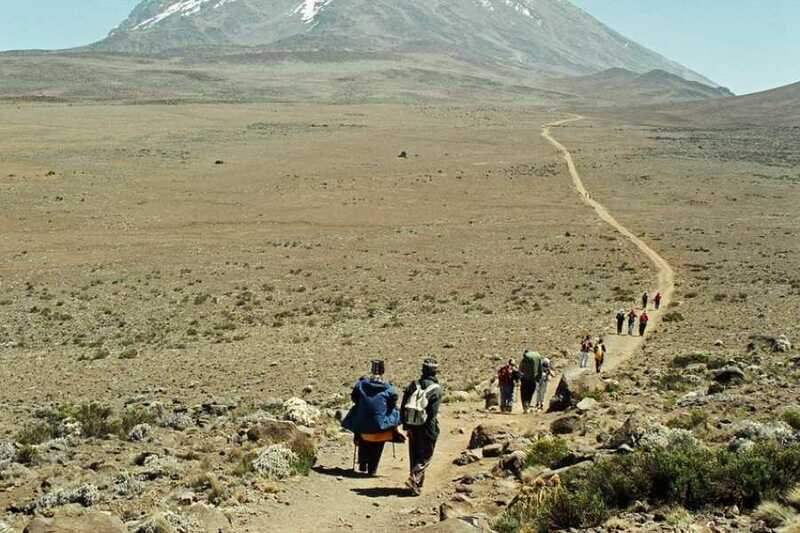 The path now forks to the right and descends into the Umbwe Valley, also called the Barranco Valley, and the night is spent at Barranco camp on the valley floor at 3985 metres. This is an interesting day, since climbers ascend to 4500 metres at lunchtime, but then descend to a camp which is only slightly higher than where they were in the morning. The path climbs out of the Barranco Valley via the Barranco wall. This is a steep 1 to 2 hour climb, ascending about 300 metres. The path then follows the gently undulating Kibo South Circuit. Wonderful views are to be had of Kibo's southern glaciers if the weather is clear. After about 3 hours the Karanga valley is reached. There is a short but steep descent into the valley, which has a small stream running through it, and then a short climb up the eastern valley wall. At the top of the wall, at 4000 metres, is the Karanga Valley camp. Lunch is usually had here, and then the path climbs for about 3 hours to Barafu camp at 4600 metres. As described above in day 5. Although Barafu camp is visible from early on in the trek, as one nears the ridge upon which it is located it disappears from view. You are walking in high altitude over slate type scree with interesting views of the final ascent route and as one nears Barafu camp on the opposite side of the valley are terrific views of the ridge known as The Red Wall. Climbers are woken at about 11pm. After dressing in all their warm clothing, they have a hot drink and then set off at midnight. The first part of the ascent is on a rocky ridge. This then turns into scree. The surface is loose and can be hard going. On its steepest sections, the path zig zags up the scree. It takes an average of 7 hours to reach Stella Point on the crater rim. On a fine morning, the views of the sun rising from behind Mawenzi are spectacular. Stella Point is at 5,750 metres. From here, the path goes around the crater rim for a further hour to the summit at Uhuru Peak, 5896 metres. The descent back to Barafu Camp can take a further 3 or 4 hours. 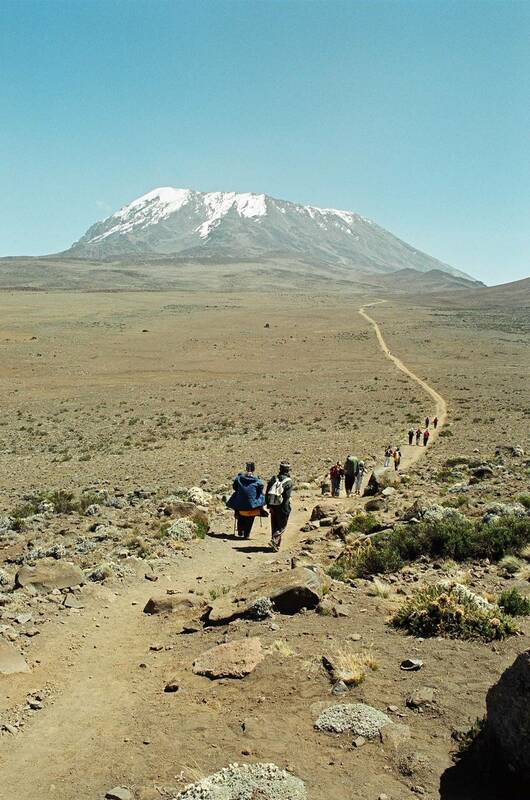 After a rest and a meal, the descent continues to Mweka Camp at 3100 metres, a further trek of around 4 hours. If climbers are very tired, or if it is late, camp can be made at Millennium Camp at 3800 metres – this simply increases the length of the following walking day by around an hour. The path descends for around 3 hours through the forest to Mweka gate. Vehicles will be waiting to transport climbers and crew back to Marangu Hotel. Accommodation before or after the trek. This can be arranged if you desire. Gratuity for guides and porters. Anything not specifically mentioned in the itinerary.